The biography of St. Gabriel was written soon after his repose by one of his close disciples, Archimandrite Symeon Kholmogorov, in an engaging and moving style. This biography bears witness to the elder’s unceasing and ardent prayer, his spiritual experiences, wondrous visions, and clairvoyance, as well as the Divine healings wrought through his prayers. Having single-mindedly sought after the highest good of love for God and man from his youth, he was granted a profound revelation of God’s love for the world, seen in His redemption of the human race. This revelation filled him with overwhelming gratitude to the Lord, especially as he contemplated Christ’s earthly life. Thus was opened to him that which he longed for: the experience of love for God with his entire being. In his emphasis on God’s love for man, and on man’s grateful response to it by loving God and neighbor, St. Gabriel reminds one of holy Athonite elders of more recent times, St. Porphyrios of Kavsokalyvia (†1991) and St. Paisios of Mount Athos (†1994), both of whom have been glorified by the Church in the last few years. This new, greatly expanded book on St. Gabriel contains the elder’s Life — first published in English as One of the Ancients — and, for the first time in English translation, his complete writings and letters to spiritual children, as well as an Akathist hymn. 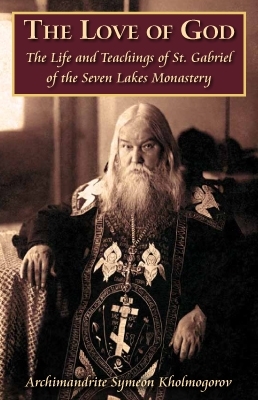 It also features a biography of the author, who suffered martyrdom at the hands of the Communists in 1937.